Home / Adventure / And Day 1 of the Trek is here!!! A very early wake-up call at 5am to get everyone ready for the 8am departure. I started feeling a little anxiety as I was packing the luggage I’d leave behind I won’t see until June. Strange to fold regular clothing (jeans and shirts) that would be left in the hotel. With the girls, making sure everyone is outfitted properly and that all the gear is in check. Very quick and early breakfast and by 8:10am we were all in our way. Surprisingly Kathmandu was experiencing a little bit of sunlight and good chances our flight will be departing today. As we got to the airport, quite a busy scene as all the flights that had been suspended from the day before were departing today. 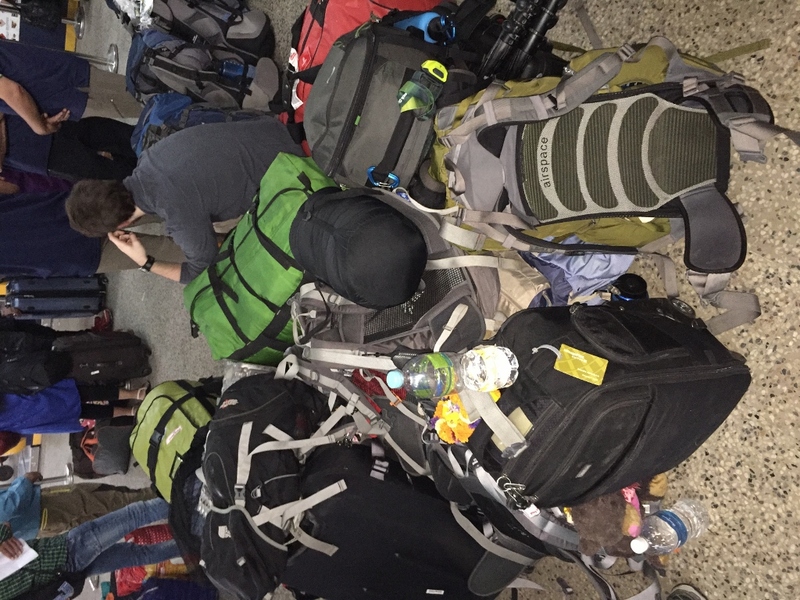 Our 9:30am flight was delayed with the backlog and also the weather in Lukla and our new ETA would be 11:30am. I also came to find out that in Nepal, local Nepali’s can only be charged 1/3 of the standard airfare of foreigners and because of this rule, airlines dislike flying Nepali’s. 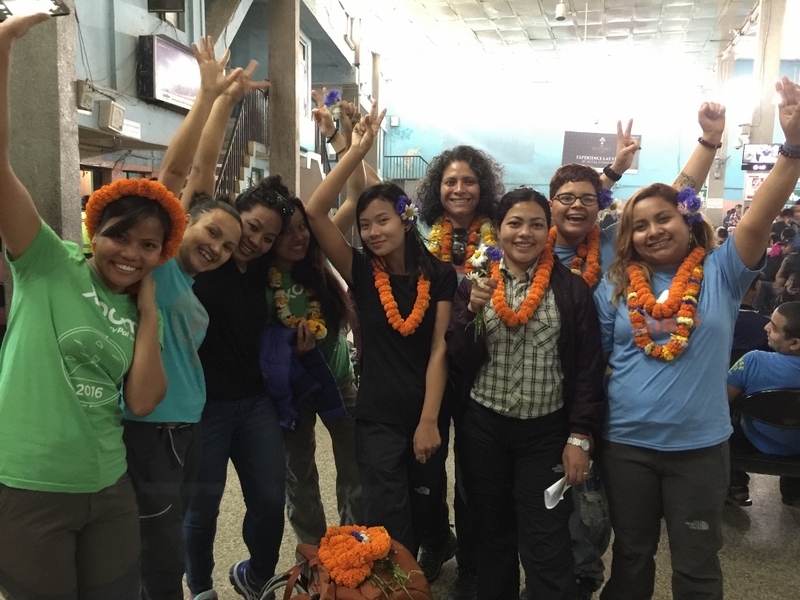 Given that we are in the heart of the busiest tourist season and with the backlog, 3 of our Nepali girls got scheduled on the latest flight. 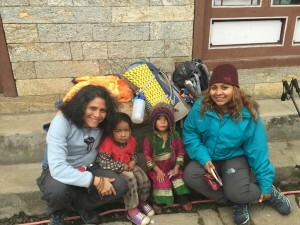 So that’d mean that once we’d arrive to Lukla, we’d have to wait for the rest of the 3 girls before starting the trek. It was sweet that Maya came to send us off and more Lei’s were given to us. By 11:30 we were allowed to get into the departing area and as we remained hopeful that the other 3 members would be coming later, we were all excited for the journey ahead. Our flight departed by 12:30 and by 1pm we were in Lukla. A very bumpy flight that shook all of us but arriving at Lukla was very special. As we headed to the tea house next to the airport and get lunch and wait for the other team, it was sweet to bump into a familiar face. One of Peru’s most famous mountain climbers – Richard Hidalgo, who has been climbing the tallest 14 peaks around the world without oxygen. He was there with a camera crew and it was sweet to chat for a little bit. As we ordered our meals, we got news that the Lukla airport would be closing as weather conditions got too cloudy. That meant that the 3 Nepali girls would only join us tomorrow. Quite disappointing but maybe happening for a reason. We then started our trek with the remaining 6 of us. After hiring our porters, we were going to make it into Phakding. The clouds brought a chilliness to the ambiance, though given the amount of weight I was carrying on my backpack, within 30mins I was down to my T-Shirt. I was amazed by the number of people in the trail up and down, definitely the midst of a busy season. Seeing so much activity of tourist and locals alike made the journey feel so alive. Since we started the trek around 3pm, which is quite late, we kept a decent pace to make it into our tea house before it got too dark. Even though it’s only been 4 ½ months from my last time on this trek, the significance was very meaningful to me. As we got into the various check point permits, showing that I had a special permit to climb Mt. Everest made it super real. On my last 2 days in Kathmandu, the recognition people gave me (especially locals) when they found out I was attempting Everest was quite unique. We reached our guest house in Phakding by 6:40pm, as the darkness settled in. 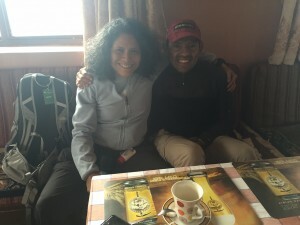 Some of us were more tired that others, if anything lack of sleep can easily be more palpable on altitude and at least being on the trek would assure that we’d have to be in bed no later than 10pm as the lights in the whole tea house would get disconnected. The girls we rightfully tired and being out of the normal element in SF can have the traditional out of place effect. By 9pm everyone was in their rooms and we got word the 3 remaining members would be boarding one of the earliest flights. Based on how everyone feels in the morning, we’d either make it into Monjo or Namche Bazaar. By 10pm I was cozied up on my warm sleeping bag, ready to drift into altitude dreams.